Farmers are risk averse; flexible short-term credit and quick return on investment are, according to practitioners, core drivers of smallholder behaviour. Managing heterogeneity is key when working with smallholders. Successful practitioners listen to farmers and tailor products. Organisational structures can improve the efficiency of social exchange by promoting trust between farmers, companies, and NGOs. Smallholder farmers are not obliged to mirror a corporation’s industry preference; unsustainable interventions may result in switching behaviour from one crop to another. Researchers can improve smallholder yield by helping corporations understand and influence smallholder farmer behaviour. What does it take for poor farmers to try new techniques? What challenges do cocoa famers in West Africa face? Why has improving yields and incomes been such a hard nut to crack? What does mobile technology have to offer? The answers to these questions are found in the economic and productive lives of those at the very farthest reaches of the supply chain; declining yields, farmer exit, and aging cocoa trees cement the urgency of finding them. This is not simply an academic or philanthropic exercise: the flourishing of smallholder farmers is integral to the sustainability of multinational food and beverage corporations like Mars, Incorporated. How, fundamentally, can corporations address this issue by making cocoa cultivation more sustainable and lucrative for farmers? With this motivation in mind, Oxford’s Saïd Business School, in partnership with Mars Catalyst and with the support of Opportunity International, led a series of hour-long pre-interviews as well as an extended, two-hour, in-depth focus group discussion. Participants were practitioners working directly with smallholder farmers and at the forefront of introducing new practices and technologies to the issues of sustainability, poverty, and productivity. Before moving forward, the authors would like to thank the participants for their generosity, time, and insights; John Magnay, Opportunity International, for helping to convene the session; Vidya Rangan, ISEAL Alliance, for her excellent facilitation; and to Mars Catalyst for their on-going contributions to this productive partnership. Any errors are the authors’ own. Conversations with interviewees stressed the importance and complexities of increasing smallholders’ net income in the long-run, whether by increasing yields, by repositioning farmers in the value chain, or by ensuring that farmers are paid market price for their crops. This is not to say that classic development agendas such as gender dynamics, technology adoption, and the organisation of labour are obsolete. Rather, the experts emphasised that their relevance is changing to fit within the overall agenda of increasing smallholders’ wealth and ensuring the long- term sustainability of interventions. Against this background, three key themes emerged: adoption of innovative practices, trust in partnerships, and sustainable interventions. Adoption of innovative practices, which may be integral to increasing yields and thus incomes, hinges on changes in farmer behaviour. This remains a real challenge in the development space, and accordingly researchers are applying new experimental methods to expand our understanding of farmers’ adoption behaviour (Duflo, Kremer, & Robinson, 2011; Jack, Oliva, Severen, Walker, & Bell, 2015; Liebenehm, in preparation). Increasing income by increasing productivity is a good ‘North Star’ for any intervention. Demonstrating the efficacy of a given practice, however, is a necessity for ensuring high adoption rates. As one expert put it, ‘seeing is believing,’ and local demonstration farms showcasing new practices and increasing yields can help to ‘convince’ farmers to change their behaviour. Following this creed, some companies invest heavily in demonstrating the utility of a promoted technology or practice by, for example, offering to spray fertilizer directly on the smallholders’ crop to demonstrate its effect on crop growth. While companies (with good reasons) are interested in their core business and its value chains, smallholders are not obliged to mirror the corporation’s industry preference. Demonstrating a cross-sectorial value proposition can help mitigate switching behaviour where farmers continuously change crops to access new subsidies. As an example, I believe we have a scenario in Ghana, there is a lot of competition between oil palm, rubber and cocoa, the same land and on the basis that the cocoa is the older crop and is going to be grubbed, there has to be a comparative value proposition between any particular product and, you know, farmers will make decisions according to the resources that are brought to it. Many years ago I saw new value chains purely because the technical support was available in the value chain, but as soon as another one came along and another value proposition was placed in front of them, not comparing it to the first or another value chain, they went for that one because they were getting technical support and pre-planting material or finance or something around it. So the, the sort of the approach to the community needs to be from a position where you can actually improve the value proposition for the chains. Once the income question is addressed, risk aversion is another key barrier for technology adoption. Smallholders are risk averse (Dercon & Christiaensen, 2011; Feder, 1980) because, as one expert explained, farmers wish to feed their family, provide their children with an education, and similar social goals; adoption cost, combined with constant liquidity constraints, can seriously threaten these goals for smallholders. In this landscape, NGOs and companies committed to change behaviour can bear some of these risks for farmers, or as one expert said, ‘it’s my job to fail so that farmers don’t.’ For example, an NGO operating in Malawi is installing new irrigation equipment free of charge, whilst letting farmers keep the potential gains of increased production. Again, this exemplifies an upfront investment by the intervening partner in order to demonstrate the efficacy of the intervention and share the potential downsides of trying an innovative practice (e.g. the investment risk, as well as the possibility that the ‘innovation’ reduces yields). Because it can be costly for companies to carry all the risk for farmers, the experts more generally advised to keep overhead cost low, return on investment short, and encourage household strategies that satisfy short-term needs to ensure smallholders’ liquidity. Though general lessons can be drawn, farmers are a heterogeneous group that face different challenges and risks. For example, one expert explained that female farmers in Côte d'Ivoire, Ghana, and Kenya cannot get land tenure, leaving them to deal with highly specific challenges and risk profiles. Market segmentation can help companies in tailoring tools directly to farmers’ individual needs, but, the expert warned, interventions and products that disturb local power structures may result in reduced adoption rates. As one respondent reflected: ‘[I]t’s the chief, you know, it’s local power structures, is the local chief in the community happy to see this change or not happy to see this change, that's critical.’ Awareness of broader socio-political dynamics is also necessary and cannot be lost in efforts to change practices at the micro-level. How and to what extent larger structures – whether they be land laws, cocoa boards, or the vagaries of global capital – can be incorporated into management practices remains an open discussion. ...let's say the private sector would be interested in working with the guys who are doing full- time cocoa or maybe one hectare of cocoa as a minimum farm. But that's probably only twenty, thirteen, forty thousand cocoa farmers in Ghana, nobody really knows. Half the cocoa farmers are probably taxi drivers and the tree is outside their front door. This heterogeneity and large number of small farms presents companies with both opportunities and challenges. Less experienced smallholders represent a large untapped production potential. At the same time, some might be uncommitted to the cocoa industry and geographical dispersion make them costly to reach. There are increasing opportunities to target interventions to farmers by responding to his or her skills, aspirations, and endowments; understanding their different needs is important. Low cost interventions may increasingly be designed to appeal across this spectrum of experience and scale. Some mass, participatory tools are relevant for engaging both well-established farmers and novice smallholders. Examples include cell phone apps providing farmers with updated crop prizes; participatory performance tracking methods that help farmers in identifying the practices they need to change to improve their productivity and; mobile farm management programs that allow them to track changes in their own practices. When designed right, such technologies also provide a vital feedback loop between smallholder farmers and corporations. One expert explained how this had been applied using a mobile application. ...through the mobile applications, [we] had an application called Pulse which essentially let any farmer come to a community knowledge worker and document a comment, compliant, question, and essentially they would categorise it and say, you know, I wanted information on beekeeping or an organic solution to this pest problem that I have in Cacao, you know, and I couldn't find it, what's your recommendation. So it was a direct feedback channel for saying hey, you know, I have an unmet information demand or also lodging a complaint and that would then be created as a ticket that our customer care team would address. Participatory tools, however, also have their own limitations and are not a panacea to the technology adoption challenge. To avoid these pitfalls, participatory technology should be designed to be skills appropriate and cannot fully substitute face-to-face time: ‘the more face time with the client or the farmer, the better,’ as the experts continuously emphasised. ‘Face time,’ regardless of its buzzword character, is a vital way for the experts to build trust and sustain partnerships, which are this text’s remaining two themes. Trust is vital for efficient social exchange – whether between corporations and NGOs, NGOs and farmers, or between farmers themselves – and building trust is one of the key challenges practitioners face. In examining cocoa value chains, each link demand trust, particularly in the context of a weak legal and regulatory environment. From an academic perspective, we delineate between personalized and generalized trust; the former is a person-specific attitude that develops over time and through interactions, while the latter emanates from more general knowledge about a group of people – arising as soon as people interact (Fafchamps, 2006). The experts pertinently highlighted the tension between the two and the potential business case it presents in, for example, Côte d'Ivoire, where approximately 700,000 smallholder families depend on cocoa production as their main source of income. How can we develop individual ties, at a large scale, under resource constraints? Three themes emerged from the discussion: extending trust, creditor/debtor trust, and trust in markets. In reflecting on the relationships between farmers, NGOs, and companies, the experts suggested that organisational structures that facilitate effective information exchange extend trust. Well- organised smallholder farmers are also easier to reach because cooperatives and farming groups allow companies to engage with a larger number of smallholders than would be possible on an individual basis. Successful cooperatives, according to one expert, align their individual incentives, follow professional meeting procedures, and are limited to around eight to fifteen members. This can strengthen social cohesion by steering behaviour towards the common goals set in the group. ...if the group’s too big you can have a dilution of that cohesion which can make accessing that group of farmers very, very difficult and very much more time-consuming, there's more conflict and the results would be less satisfying for both parties. So I would want to really make sure the farmer group formation is linked in to an alignment of incentives, and that incentive for me is all linked to improved productivity and profitability. Other management practices mentioned by the experts are community representatives and village- based extensions services. Having trusted agents on the ground that are close to farmers and farmer peers and participation in, particularly when it comes to adoption and best practices, it’s really critical. I think there's a lot that can be leveraged in terms of, you know, social relationships, positions of leadership. Community representatives who function as the links between the community and the company or NGO, firstly, give a better understanding of the social relationships and power structures within the community; secondly, can help demonstrate the potential outcomes of new agronomic practices to farmers and; finally, can help with the continuous collection of appropriate data. The village-based extension service is a more comprehensive model where farmers in the community provide these links to the company, as well specific equipment and information relevant to farmers. ...for them fairness and financial services might be something that has more to do with flexibility and whether or not they'd lose their land, rather than transparency and fair rate. From the perspective of the lender, the main concern is to manage the risk of their portfolio. Access to farm-level information helps creditors assess this risk. Some lenders do this by capturing data around social metrics such as, for example, the number of children in the family, farm size, and gender. Using mobiles to access electronic bank accounts can help lenders capture this data, as well as spare farmers from long walks to the nearest city to go to the bank. Most importantly, as explained by one expert, building a positive credit history spanning several business cycles is key in ensuring creditor trust in the farmer. ...when we start talking about management practices for those services, you know, from our perspective we really come back to this idea that lending at its core is a relationship business, it's developing trust between the financial institution and the farmer. Historically, farmers were excluded from accessing cheap credit and only connected to companies as price takers. Changing this is difficult and creditors as well as companies should be ambitious but realistic when considering the type of ties they wish to form with cocoa farmers. Why are partnerships valuable to your organisation? ...digital technology, mobile platforms is seen to be a very important driver for efficiencies and stuff like that. But we are dealing with let’s say, I haven't thought of a better word, an uneducated, certainly not unintelligent, they're intelligent, they're switched on, but they're an uneducated community by and large, literacy could be quite low as well as numeracy. Furthermore, market awareness does not equal market access, and typically when smallholder ‘run out of money at harvest time, they're desperate,’ which often result in them selling their crops at below market price, experts explained. Management practices that ease smallholders’ time- constraint in selling crops are therefore a potent way to improve their market access, and in the long-run, build trust in markets. We have an example which was surveyed in Uganda in the coffee sector, that only thirty per cent of the coffee was going through the formal marketing chains at premium prices, and that's because the coffee was very often committed or the trader paid cash on the day whereas they would have to wait two or three weeks to get the premium payment through the formal market. So even though they knew they could get thirty-five per cent more, they didn't take it up because of their immediate cash flow needs. To this end, pre-sell agreements based on pre-planting prices, for example, can provide farmers with much needed liquidity, and thus price stability and predictability. In the medium-term, price consistency is a key signal ‘to our smallholders who literally are falling in and out of poverty based upon the success of failure of the markets’ on interviewee explained. In the long-term perspective, some of the experts opine, the goal should be to free smallholders from a vulnerable price takers position by moving them up the value chain, forewarning specific perspectives on sustainable interventions. As the work of each of the experts illustrates, relations between NGOs and corporations are integral to multinational food companies’ supply chains. Accordingly, there has been a surge in new NGO-MNC ‘partnerships,’ which are seen as a vital way to better access and serve those at the base of the pyramid (Beninger & Francis, 2016; Gereffi, Garcia-Johnson, & Sasser, 2009; Perez-Aleman & Sandilands, 2008). In this context, partnerships are relationships that purposefully aim to produce more than short-term capital gain; at their best, partnerships are ‘more than the sum of their parts,’ allowing all parties to achieve what they could not do alone. However, these partnerships are not straightforward and often involve very different organisations and organisational logics. Establishing long-term relationships, which make room for failure, learning, and adaptation, enhance trust and may improve outcomes for all parties. Recognise that farmers are often excluded from the national market due to distance to market, time-constraints in selling crops, and the lack of appropriate certifications. In addition, some nations are not able to negotiate good crop prices. Sustainability, for the experts, points towards long-term changes of the entire value chain. This echoes voices from international development studies who argue that the sustainability of interventions should be judged by its long-term impact on poverty reduction (Taylor, 2014). However, ethical and ideological tensions are hiding below the surface and companies should ask themselves: Who is the intervention for? What does this group want and need? And what role does the company play in affecting such change permanently? These are complex questions that yet remain to be answered fully. In bringing forward the perspectives of practitioners, further interviews would have merit. During the interviews, however, the experts provided their experience on how to improve the sustainability of interventions by focusing on sustainable relations, measurements, and an ecosystem approach to interventions. ...until interventions become integrated in to the actual operation in the supply chain, they really won't last or have a lasting impact. Beyond sharing profit in the value chain more evenly, opting for having local rather than foreign agents ‘on the ground’ can also increase the chances of them remaining in the value chain the in the long-run, as can targeting community leaders in the intervention. Some companies knit close relationship to farmers by organising them, providing training, and offering vital inputs such as liquidity and trees. One interviewee, for example, explains how a tobacco company has used such a model successfully in Malawi, in order to access quality products. Another expert had similar experiences from the beer industry with smallholders in Ghana. ...embedding of those solutions in to their [company’s] core business so that it is sustained over time, and kind of the measurement of what that value is so that, you know, it’s clear whether or not it makes sense for them to pay to maintain that. This commercial tenet follows the general consensus among the experts that the primary focus should first be to increase income. This is not to say that classical agendas such as gender are irrelevant, rather that their importance may be gauged by the degree to which they increase income and support sustainable relationships; measurements provide a way to unpack these effects and idiosyncrasies in a way that is generalizable and that, ideally, can be shared within partnerships. ...to address some of these larger challenges like aging plantations, it really requires an ecosystem approach, you need financing, you need planting materials, you need a market and you need somebody to provide the extensions. Coordinating the actions of multiple stakeholders calls for partnerships, contextual knowledge, and long-termism. Some of the other key challenges in the cocoa industry, according to the experts, are of a more fundamental character, which requires changes to the industry at large. According to the experts, the key challenges for the cocoa industry will be to consolidate farmland at a large scale, ensuring liquidity in the farming sector at large, restructuring value chains geographically, and facing the industries age-challenge. Obviously one company cannot solve all of this on its own, but, this initial discussion has highlighted some key management practices that merits further exploration. Build close ties to smallholders and communities by offering a range if services before, during, and after the production process. Farmers are risk averse, and the practitioners find that flexible short-term credit and quick return on investment are key drivers of smallholder behaviour. A growing body of literature is now using experimental methods to explore, what it is, that drives farmer behaviour. Managing heterogeneity is key when working with smallholders. 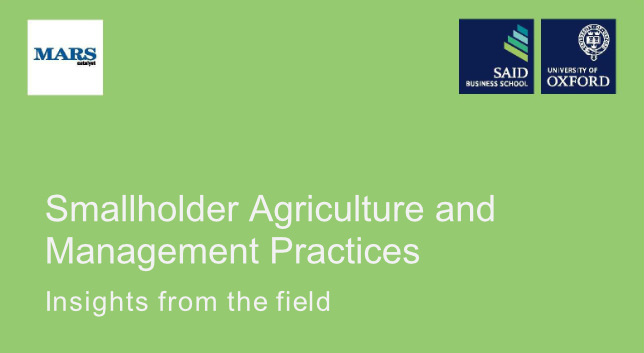 Successful management practices are based on, listening to farmers, and tailoring products. Measurement is one of many ways in which a company can listen. Organisational structures can improve the efficiency of social exchange by promoting trust around farmers, companies, and NGOs; keeping farmer groups small and follow professional meeting structures may improve social cohesion. Going forward, the challenge is to implement sustainable interventions that combine multiple approaches while knitting lasting commercial partnerships. This is in part done by coordinating actions between different stakeholders in different value chains. In a world consisting of finite resources, increasing smallholder income is a political question with its own history throughout which the discussed challenges, opportunities, and market structures have developed. It is within these confines that the practitioners we interviewed operate on a day- to-day basis. Large corporations, that think long-term, hold the power to render these structures plastic by transforming industries. This is not a question of charity. Smallholder farmers are under financial pressure and thus may choose to switch crops or even exit, contributing to global patterns of urbanisation and threatening the sustainability of the industries that rely on these raw materials. Research can help corporations in countering such trends by unbundling and clarifying what it is that drives adoption, how trust is built in partnerships, and how to ensure their longevity for decades to come. Beninger, S., & Francis, J. N. P. (2016). Appropriation of Community Knowledge Towards an Understanding of the Potential Harm and Benefits. Journal of Macromarketing, 36(2), 183–197. Dercon, S., & Christiaensen, L. (2011). Consumption risk, technology adoption and poverty traps: Evidence from Ethiopia. Journal of Development Economics, 96(2), 159–173. Duflo, E., Kremer, M., & Robinson, J. (2011). Nudging Farmers to Use Fertilizer: Theory and Experimental Evidence from Kenya. American Economic Review, 101(6), 2350–90. Fafchamps, M. (2006). Development and social capital. The Journal of Development Studies, 42(7), 1180– 1198. Fafchamps, M., & Minten, B. (2012). Impact of SMS-Based Agricultural Information on Indian Farmers. The World Bank Economic Review, 1-32. Feder, G. (1980). Farm Size, Risk Aversion and the Adoption of New Technology under Uncertainty. Oxford Economic Papers, 32(2), 263–283. Jack, B. K., Oliva, P., Severen, C., Walker, E., & Bell, S. (2015). Technology Adoption Under Uncertainty: Take-Up and Subsequent Investment in Zambia (Working Paper No. 21414). National Bureau of Economic Research. Liebenehm, S. (in preparation). Too risk-averse and too myopic to avoid losses? Insights from a dynamic field experiment in West Africa. Perez-Aleman, P., & Sandilands, M. (2008). Building Value at the Top and the Bottom of the Global Supply Chain: MNC-NGO Partnerships. California Management Review, 51(1), 24–49. Taylor, B. (2014). Who Wants to Give Forever? Giving Meaning to Sustainability in Development. Journal of International Development, 26(8), 1181–1196. First published 5th September 2016 by the Mutuality in Business Research Team. The web text is based on the paper written by researchers at Saïd Business School, University of Oxford. The views of the authors and/or the University from are distinct from other content on this website. Morten Hansen, Research Associate - has a background in international education and a MSc in Comparative Education at the University of Oxford. Kate Roll, Research Fellow - leads research for the Mutuality in Business Project and also lectures in Politics at the University of Oxford. The conclusions and recommendations of any Saïd Business School, University of Oxford, publication are solely those of its author(s), and do not reflect the views of the Institution, its management, or its other scholars.